It is time for my second quarterly report of 2019. 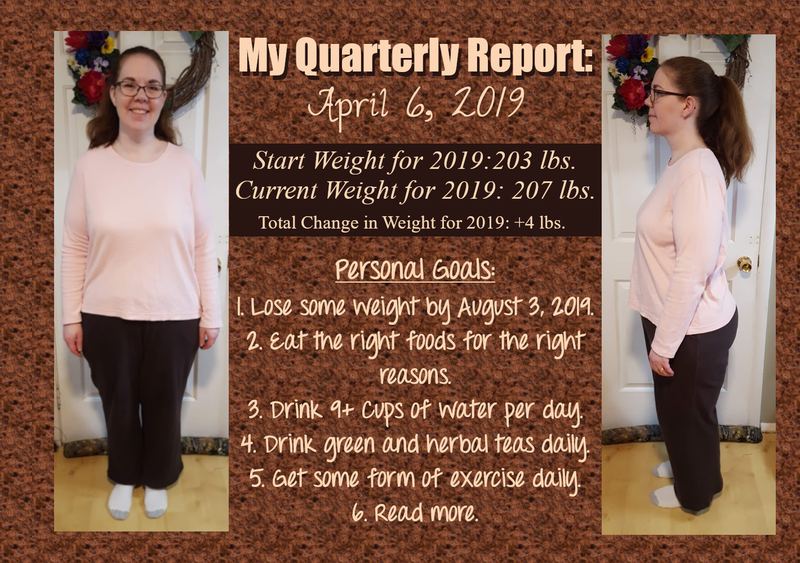 On the first Saturday in January, April, August and December, I will be posting a quarterly report of how I am doing in regards to meeting my goals, and what my goals for the upcoming quarter will be. Goal #1: Lose some weight by April 6, 2019. I did not meet this goal, much to my chagrin. This last quarter was a roller coaster ride for me weight-wise. I did not do well, and it was frustrating! I'd lose, then gain, lose, then gain, repeat! It drove me nuts! I topped out at 212 lbs. in March, so I am glad that I have lost 5 lbs. since then, but upset that I gained nearly 10 lbs. to begin with. I know part of the problem is not being able to take a water pill to help with water retention, but I also know that I need to eat better and exercise more often. Now that the weather is getting better, exercise should be easier. Goal #2: Eat more foods that benefit. I think this was about a 50/50 thing. Some weeks I'd do great, and others - not so much. I will probably keep this as a goal for this next quarter as I think it is something I definitely need to keep working on. I did accomplish this, but some days were harder than others. I have no idea why this has been more of a struggle lately, but I will keep plugging away at this. I didn't normally drink both teas daily, but I always had green tea daily. I am going to keep working on this, too. I normally got some form of physical activity daily, but some days were next to none. I am hoping to improve this, as I know I need to be more active. I am reading daily, but not really for pleasure, so I would say I didn't really reach this goal. It is something I will keep working on, though. I want to eat right and for the right reasons. I decided to modify last quarter's goal slightly because I know my eating habits need work. I can be an emotional eater, and I tend to eat things because "it's there" at times. I sometimes go for the ready-made option because I am not in the mood to make a meal or because I think it may be less calories than the homemade version. Here's the thing: I am beginning to remember why counting calories doesn't work for me. I really believe not all calories are created equal. We would all agree that eating, say, a 100 calorie banana is better than eating a 50 calorie banana muffin, but yet we still convince ourselves that the muffin is better because it has less calories. We forget that it also has more additives and man-made stuff. Anyway, to simplify put my goal: I want to eat more natural/less carb-y foods (less preservatives, sugar, man-made additives, etc. ), and work on only eating when I'm truly hungry. I want to continue to drink 9+ Cups of water per day. This may end up being one of those "always on the list" goals. I know drinking enough water is essential to my health, so I want to always make sure it is a priority. I am perplexed why I struggle with this at times because it should definitely be a habit by now (I've done it for several years), but yet it is still hard at times. Anyway, I know with the warmer weather coming up, this is especially essential. I want to drink some green tea and herbal tea daily. I have noticed that when I drink green tea, I do have an easier time losing my water retention and weight in general. I also know that herbal teas greatly help me when I am feeling unwell, and sometimes they help curb my appetite. I feel like I have the green tea part of this goal down, but I really want to make it a habit, and I really do want to drink herbal teas that benefit me, too. I am thinking I will start with trying to drink peppermint or my ginger peach tea in the evening to help with digestion. I have a few others, too (this brand namely), that I want to start being my go-to when I am having issues that the tea is supposed to help with. Wish me luck! I want to get some form of physical activity daily. This goal should be a lot easier now that the weather is getting better. I try to take the kiddos on a walk with me after they are done with their school work, and then get at least one more in later in the day. We love to hike, so I am going to request to do that more during the spring/summer. My family loves to go to the beach, and sometimes I forego going because I am not a fan of swimming. I think I'm going to work on going anyway, even if it is just to go wading or walk the beach. It'll be good for me! We'll see how it goes! I want to read more. I really want to read for pleasure more. Truly. I do miss it. I have told myself that I don't have the time for so long that I have made myself believe it. Truth is, I do have the time, I just need to make reading a priority. Wish me luck! I have a plethora of Mary Higgins Clark's to read (and several other mysteries), and I think it really is time I dive into them again.